When Jesus ascended to Heaven, He sent the Holy Spirit to His followers to give them the divine life of the Trinity. Why, then, did He also give them a meal of Bread and Wine to attain eternal life? Our Easter lectionary readings moved us through Christ’s Resurrection, Ascension, and the Descent of the Holy Spirit. Last Sunday, we celebrated the Most Holy Trinity, because we understood, from all that history, that God is Father, Son, and Holy Spirit; from the beginning, all Three Persons have lovingly worked to restore us to the life for which we were designed. We might, therefore, conclude that the history is now liturgically complete. Yet today, the Church calls us to another solemnity. In our readings, we are pondering the mystery of the Most Holy Body and Blood of our Lord in the Eucharist. This meal raises a question: If we now have the Holy Spirit to put God’s life in us, why do we need to “eat the Body” and “drink the Blood” of Christ? What does that accomplish that the gift of the Holy Spirit doesn’t? Our Gospel reading begins midway through a long conversation Jesus had with people who tracked Him down after His miraculous feeding of the five thousand (Jn 6:25-50). They were looking for more bread, but Jesus used their physical hunger to direct their thoughts to another kind of bread: “For the bread of God is that which comes down from heaven, and gives life to the world” (Jn 6:33). It worked: “They said to Him, ‘Lord, give us this bread always’” (Jn 6:34). Seeing they were interested, Jesus explained that He is the bread of life, and He called the Jews to believe in Him. In this part of the discussion, Jesus used imagery of bread and drink metaphorically: “he who comes to Me shall not hunger, and he who believes in Me shall not thirst” (Jn 6:35). When the Jews began to murmur at the suggestion that Jesus is bread from heaven (“Is this not Jesus, the son of Joseph, whose father and mother we know?”), He emphasized again that believing in Him is the source of eternal life: “Truly, truly I say to you, he who believes has eternal life” (Jn 6:47). Notice that no explanation is forthcoming. Jesus simply keeps repeating, in ever increasing emphasis: “Whoever eats My flesh and drinks My blood has eternal life.” This truly baffled His hearers, and, as reported in verses not in today’s reading, many of His followers left him because of it. Even the Twelve were hard-pressed to absorb it. There was a strong prohibition in Jewish law against drinking the blood of animals (see Gn 9:4; Lev 17:10-13; Deut 12:16). That kind of participation in an animal’s life, making a man “one” with the animal, was beneath the dignity of creatures made in the image and likeness of God. No one even thought of drinking human blood! We can understand how objectionable Jesus’ words were to those who first heard them. To remain with Him would require what Jesus had spoken about earlier in the conversation—belief. His miraculous works and His authoritative teaching had caused many to have faith in Him. That faith would have to sustain them as they digested this “hard saying.” They would have to suspend judgment and simply ponder these words. Eventually, of course, Jesus would explain. At the Last Supper, the apostles learned that Jesus was leaving them a memorial sacrifice as the centerpiece of His Church’s life. 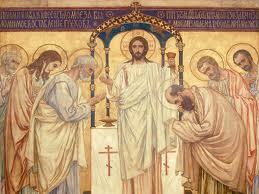 The bread and wine of the Old Passover meal were transformed into the meal of the New Covenant, the Eucharist. They would become the Body and Blood of His glorified humanity. That is how His call to “eat My flesh” and “drink My blood” would be accomplished. Believing would lead to eating. However, we may still be left wondering why God’s plan for His people included not only the gift of the Holy Spirit but also the celebration of the Eucharist. How does this act of eating Jesus in the elements of bread and wine differ from receiving Him in our hearts through the Holy Spirit? The rest of the readings can help answer this question. Possible response: Lord Jesus, thank You for remaining with us as Bread and Wine, so that we may eat and drink and live forever. In this reading, the people of Israel are about to enter the Promised Land after their long sojourn in the wilderness with Moses, made longer than necessary by their disobedience and lack of faith in God. Now, after forty years, they were ready. In Deuteronomy, Moses gives the people three lengthy sermons, reminding them of what they had been through and warning them about what lay ahead. Our reading contains one of the great themes of Moses’ parting exhortation: “Do not forget the LORD your God.” We might wonder how these people could ever “forget” the LORD, after all He had done for them. Yet over and over, Moses exhorts Israel: “You shall remember the LORD your God” (Dt 8:18). He knew they were entering a land flowing with milk and honey; life there would be much easier than it had been in the desert. He had already witnessed their short memories. He never wanted them to forget that their lives in the Promised Land depended completely on God’s love for them. As evidence of this love, Moses reminded the people that God had let them “be afflicted with hunger, and then fed you with manna, in order to show you that not by bread alone does one live, but by every word that comes forth from the mouth of God.” The people had feared starvation when they first left Egypt, but God sent down manna for them to eat each day. However, this was not simply a food supply. God told them to gather only one day’s worth of manna at a time. There was to be no stockpiling. Anything more than one day’s worth of manna rotted, which prevented hoarding. This bread from heaven taught Israel a lesson: they were body and soul. They needed bread for their bodies, but they also needed faith for their souls. They would have to live one day at a time, gathering only enough manna for one day and trusting that tomorrow, God would again provide what they needed. Every day, for forty years, they had to trust God for their daily bread (the historical antecedent for the request to “give us this day our daily bread” in the Lord’s Prayer). This is why Moses said that the manna taught the people a spiritual lesson. We need physical and spiritual bread to really live as God’s people, because we are (and always will be) body and soul. When we understand this, we are on our way to understanding why Jesus gave us Eucharistic bread and wine. The presence of the Holy Spirit in our lives is real but invisible, not open to the senses. He is Spirit; we are spirit and body. The worship of Israel always incorporated body and soul—invisible, unseen action in the heart and visible action in the body. The worship of the New Covenant continues to keep body and soul together. Nothing makes this clearer than the Eucharist! The bread and wine become Body and Blood; we take them into our own bodies in the act of eating, the most basic of bodily functions (no eating, no life). Just as the Passover meal was meant to help people with weak memories remember what God had done for Israel (and thus lead to worship), the Eucharistic meal helps us remember what Jesus has done for us (“Do this in memory of Me”), and thus becomes our worship. The Holy Spirit puts God’s own life in us, invisibly and spiritually; eating Jesus in the elements of a meal gives us physical (our flesh and blood) communion with Jesus (His flesh and blood). What a gift! No wonder Jesus told His followers, in our Gospel reading, to believe (invisible, spiritual) and to eat (visible, corporeal). We believe, and then we worship, although Jesus did not, at that time, explain that the eating and drinking meant worship. Later, at the Last Supper, He instituted a meal of supernatural food and drink as our memorial act of worship in the Church. In our second reading, St. Paul will help us think more about this mysterious and blessed meal. Possible response: Lord Jesus, I know You are manna for my journey home to Heaven; please strengthen that grace in me today. The context of this reading (read 1 Cor 10:14-21) helps us understand that the Eucharist is the Church’s act of worship and that it is a sacrifice. St. Paul is warning his readers in Corinth (a notoriously pagan city in which he had preached the Gospel and made many converts) against continuing to worship at the altars of pagan idols. It may surprise us that the new converts needed this warning, but in the polytheistic cultures of the Greco-Roman world, people worshipped many different idols at the same time. St. Paul says that drinking “the cup of blessing” (the wine of the Eucharist) and breaking the bread gives the believer a “participation” or “communion” in the Body and Blood of Christ. This is an exceptionally clear description of what happens during the Eucharistic meal. Far from the bread and wine being simply symbols of something that has happened or is true, the elements themselves cause the communion. For that reason, St. Paul goes on to say, worship at the altars of idols is to be shunned, because any eating or drinking that happens at those altars makes the worshipper a “partner” with demons. There are, of course, no real “gods.” St. Paul considers demons to be the source of idol worship. To further make his point about the communion that takes place at altars, St. Paul makes reference to the altars of Israel: “Are not those who eat the sacrifices partners in the altar?” (1 Cor 14:18) Sacrifices, or offerings, lay at the heart of Israel’s worship. In the “peace” or “thank” offering, the worshipper and the priest ate a meal of a portion of the animal that had been sacrificed. To eat a meal at the altar of God was to give thanks for some action of God on behalf of the worshipper; it expressed “peace” or “communion” between God and the worshipper. In the Eucharist, our thank offering of bread and wine is, mysteriously, joined to the one offering made by Christ on the Cross (God is not bound by time, as we are). We then we eat this sacrificial meal (as the Jews did at their altars) and have communion with God. What the worship of Israel foreshadowed, the worship of the New Covenant fulfills. This epistle, written about 56 A.D., shows us that right from the beginning of the Church’s life, the Real Presence of Jesus in the Eucharistic sacrifice was an established belief and practice. St. Paul makes another important point in these verses. The Eucharist is the sign and source of unity in the Church: “Because the loaf of bread is one, we, though many, are one body, for we all partake of the one loaf.” This helps us understand that our unity in the Church is both organic and visible. Our eating gives us a “participation” in Christ—we are all doing the same action (visible unity) and the “food” inside of us joins us to Christ (organic unity). Thus, our public worship is the occasion for our unity to be established and expressed. Our lives with God cannot be only private and individual (“Jesus and me”). From the start, the Church made the Eucharistic offering the centerpiece of our worship, restoring our unity with God and man, visibly and invisibly, body and soul. Blessed be the Most Holy Body and Blood of Christ! Possible response: Lord Jesus, I can barely comprehend all that You give us in Your Most Holy Body and Blood. Help me to resist distraction, lukewarmness, and doubt when I received You at the altar.